Great news. 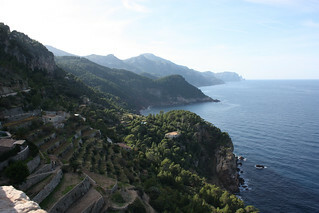 Majorca‘s wildly beautiful mountain range, the Sierra de Tramuntana, has been added to the list of UNESCO World Heritage Sites – an illustrious club of iconic destinations that includes the Pyramids of Giza, the Taj Mahal and the Great Barrier Reef. This craggy mountain range stretches 90 km from Port d’Andratx in the south-west to Formentor in the north, forming the backbone of the largest Balearic island. Known for refreshing mountain breezes, attractive, isolated villages, tiny restaurants serving huge platters of paella, the Tramuntana is the obvious place to take timeout from Majorca’s hot, heady bars and beaches … to cure your hangover and find shade from the sun. UNESCO has added the mountain range to its worldwide club of 936 Heritage Sites for the “outstanding universal value” its landscape offers. The organisation also highlights that the Sierra’s mountainous terrain is dotted with the hallmarks of a millennia of agricultural activity – such as olive tree terraces, water mills and dry stone farm houses. 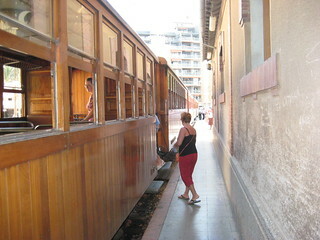 The famous Sóller Railway (Ferrocarril de Sóller) has connected Palma, the island’s capital, with the town of Sóller since 1912. In just over an hour, the vintage wooden train winds its way for 27 miles, up mountainsides, through tunnels and across valleys, before arriving into Sóller town, which is dominated by peaks of Puig Mayor – the highest mountain in Majorca. The trip is a firm favourite with families and rail enthusiasts of all ages. Details: Catch the train from Placa d’Espanya station in Palma city centre. At the time of writing tickets cost 10 euro single / 17 return. This historical religious route is well-loved by hill walkers and skirts some of the island’s highest peaks (including Puig Tomir) as it winds through meadows, orchards and oak trees, toward Lluc monastery. Local stables and cycle hire agencies can also arrange horse riding and mountain bike trips along the path. Lluc monastery holds choir concerts, has a popular botanical garden and, if you want to add a contemplative experience to your holiday, its former monks’ cells can be rented overnight. Details: Not a walk in the park, the route is 15 km long each way. 3. Canyoning, if you’re done with clubbing? Clambering onto the podiums in Magaluf’s clubs can be a challenge, but canyoning in the Sierra de Tramuntana is the real deal. A quick Google for canyoning trips on the island introduces you to an adrenaline-junkie’s day out; abseiling down cliff faces, scrambling through waterfalls and crawling around crevices. Book a day trip with qualified canyoning guide and enjoy. Beginners can dip their toe into canyoning at Torrente Coanegre (about 45 minutes from Sóller) which involves walking through a waterfall, jumping into ice-cold pools and abseiling into a gorge. Details: Your qualified guide will bring climbing equipment and wetsuits, you should bring a swimsuit, walking shoes and lightweight, warm clothing. Visitors consider this the island’s most beautiful mountain village. Sleepy Fornalutx village … all red tile roofs and painted shutters, surrounded by orange and lemon trees … is a tranquil hike away from Sóller town, along well-worn rural footpaths. Accommodation here offers holidaymakers unbroken peace and quiet and it ranges from a converted village bakery to plush private villas. 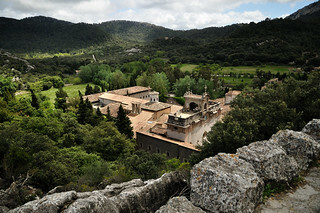 Details: Fornalutx village is a 30 km drive from Alcudia, 30 km from Palma and 35 km from Magaluf. Hire a car and take your pick of some of the most picturesque drives in the Med. Perhaps start with the drive from Palma to Inca and across the mountain rage for a bird’s-eye view of the entire island, before heading back towards the capital, stopping at Valldemossa, Banyalbufar and Port d’Andratx. Alternatively cruise along the classic coastal drive, the R710, from Port d’Andratx to Pollensa or vice versa. 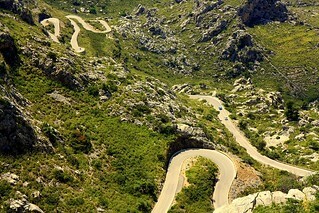 Not forgetting the most famous road on the island, the snaking Sa Calobra. Built in the 1930s to follow the natural curves and gradients of the mountain, drivers and cyclists can’t resist the challenge of the roads 270-degree looping bends.